The past two weeks we have been taking a look at products we previewed at the Summer Press Camp trade show in Utah. 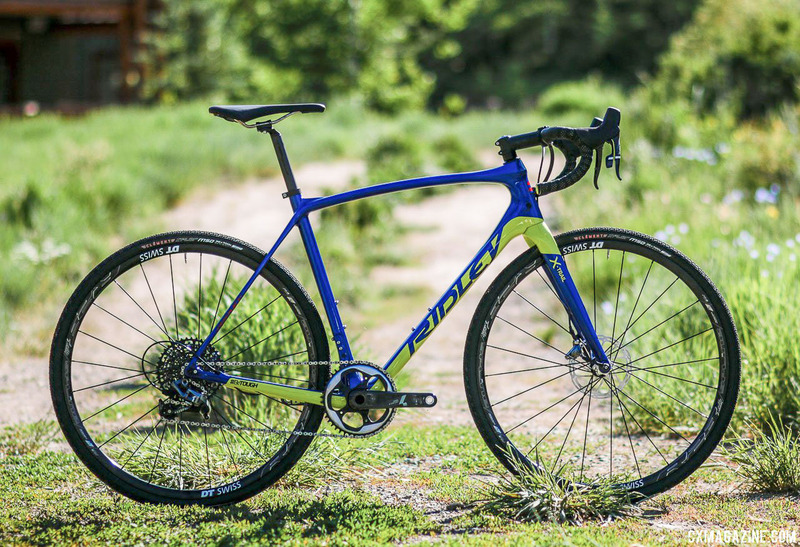 Today we provide a first look at some of Ridley’s 2018 X-Night cyclocross models and the new X-Trail Adventure gravel bike, and take a close-up look at the 2018 X-Trail carbon model. 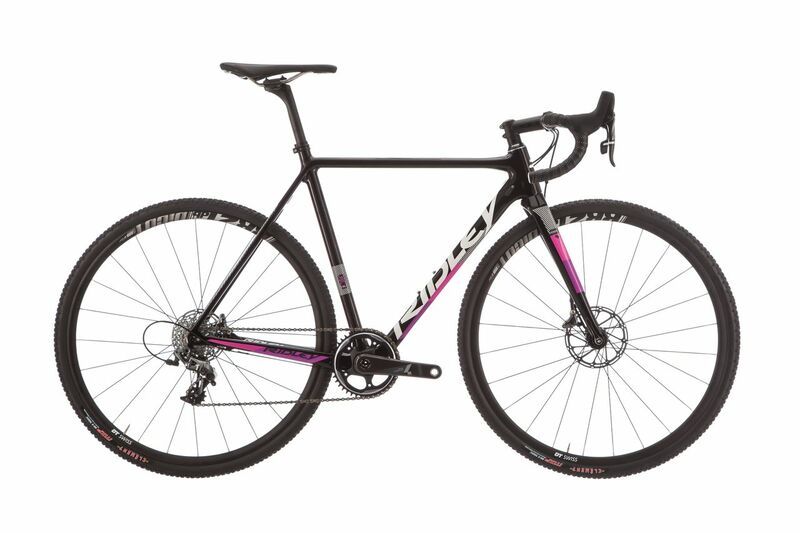 The X-Night has been Ridley’s cyclocross race bike for a number of years now. There will be no change in that tradition in 2018 with Ridley offering updated models of the race-specific X-Night SL and X-Night disc brake bikes. The two biggest changes to the X-Night models we noted at Press Camp were reductions in frame weight and the expected addition of a rear thru axle and flat mount disc brake up front to both models. While the frames shed weight, they gain mud clearance. The 2018 Ridley X-Night SL disc bike has a list weight of 850g and is expected to add a rear thru axle to the frame. photo: Ridley. According to Ridley, the big weight reductions were achieved by changing the carbon layup pattern on both models. The list weight of the 2018 X-Night SL frame is 850g and for the X-Night frame it is 1,000g. Both of these reflect a reduction of about 150g from the 2017 models, and make the X-Night one of the lightest production cyclocross frames. The 2018 Ridley X-Night disc weighs 1000g and features rear thru axle and a redesigned bottom bracket area for more mud clearance. photo: Ridley. The 2017 editions of both the X-Night and X-Night SL were offered in cantilever models, so with the near-complete movement toward disc brakes on production cyclocross bikes, it will be interesting to see if the cantilever option will be offered in 2018. Full specs and pricing are not yet final. Ridley’s gravel, or “Allroad,” line is the X-Trail. New to 2018 for the X-Trail line is the X-Trail Adventure, which is an alloy frame that provides clearance for tires up to 700x42mm or 650x50mm in width. Cyclocross Magazine got the opportunity to take a peek at the copper X-Trail Adventure at the Winter Press Camp. With the carbon and alloy X-Trail models officially offering less tire clearance, the Adventure model is a nod to a trend we are seeing in gravel bikes toward room for tires 42mm and wider. At Summer Press Camp, we also took a close-up look at the 2018 X-Trail carbon model. The SRAM Force 1 build features generous tire clearance and a lower, longer geometry with taller head tubes than the Euro-centric X-Night, which the company says leans more towards the geometry seen on American cyclocross bikes that aren’t catering to the technical, muddy, rutted European World Cups that Ridley’s sponsored pro cyclocross teams face. Check out the photo gallery below for a sneak peek at some of the builds and color schemes for the 2018 X-Night SL and X-Night disc brake and X-Trail and X-Trail Adventure models. Stay tuned for more information about pricing and the specifics on specs and builds. The 2018 Ridley X-Night SL with race-specific geometry has a listed weight of 850g and swaps a rear quick release for a 12mm thru axle. The top-shelf build features SRAM Force 1. photo: Ridley.